What comes to mind when you hear the terms “Pacific cuisine”? Have you dined at restaurants in hotels or resorts that serve “Pacific cuisine” on their menus? What do you associate as the everyday “Pacific” foods? These questions are for you to ponder on as we delve into the story of the amazing award-winning Chef and Author Robert Oliver who is making a huge impact in the culinary arts globally. Robert Oliver is a New Zealand born chef who was raised in Fiji and Samoa. Over several years, he has worked as a chef and developed restaurants in Fiji, Samoa, New York, Miami, Las Vegas, Sydney, the US Virgin Islands, Barbados, Trinidad, “farm to table” resorts in the Caribbean and food programmes feeding homeless people and African immigrants with AIDS in New York City. Chef Robert Oliver’s commitment to sustainable food production and tourism in the South Pacific led him to create a global awareness and appreciation of the South Pacific region’s local cuisines and local produce. 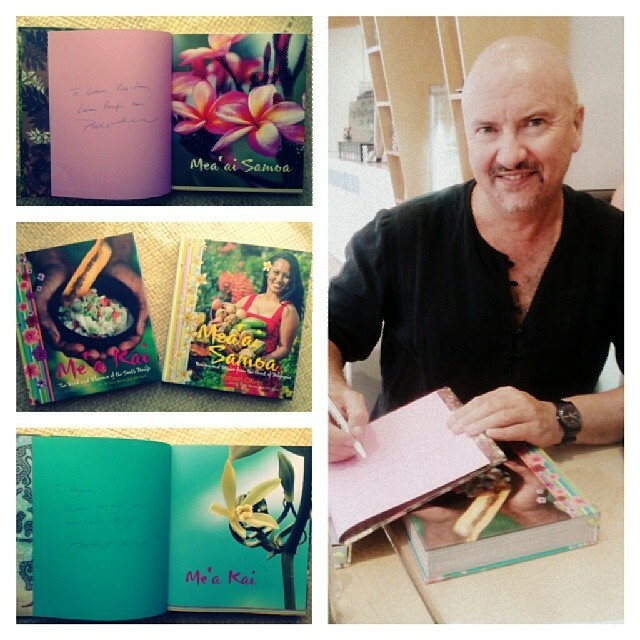 In 2008, he returned to the South Pacific to write his first book, Me’a Kai: The Food and Flavours of the South Pacific, with a vision to strengthen the connections between Pacific agriculture and the regions’ tourism sector. 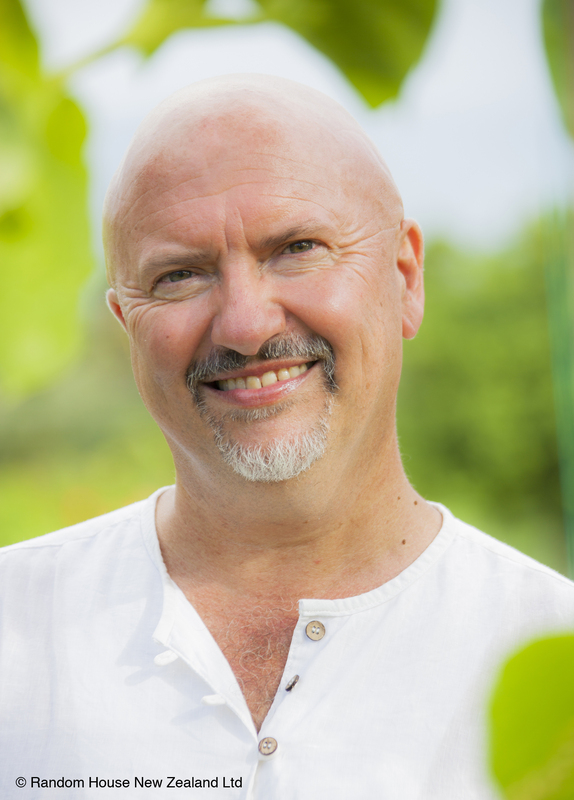 Robert Oliver is the Chef Ambassador for Le Cordon Bleu, New Zealand and the Pacific Islands. In addition, he is the brand ambassador for True Pacific, a consortium of Pacific Island food producers. He features as a columnist for the Huffington Post (NYC) and New Western Cuisine magazine (Beijing). Furthermore, a television series entitled Real Pasifik was launched in New Zealand towards the end of 2013 that is based on his work and the food culture of the South Pacific and it is set to be televised globally this year. 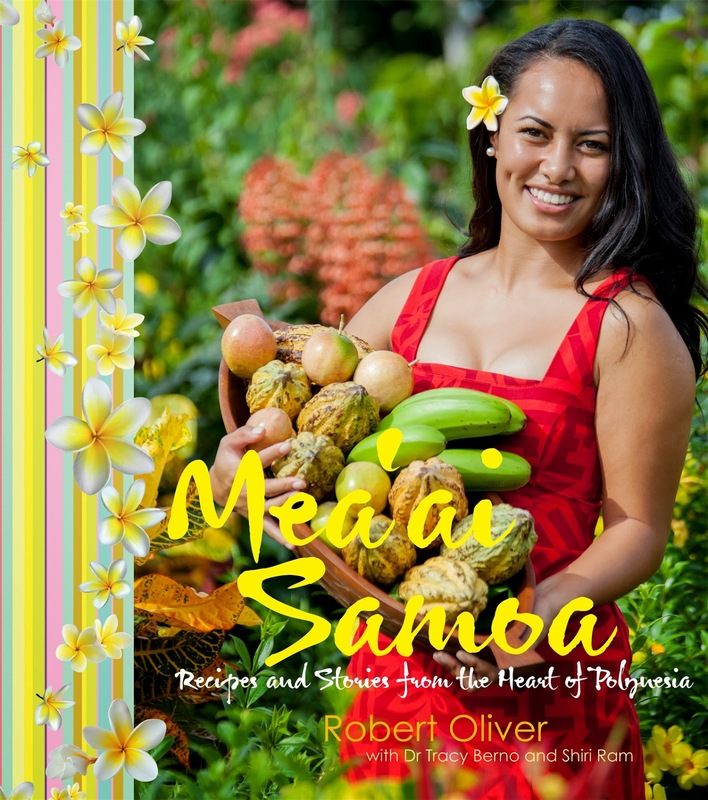 In addition, Chef Robert Oliver’s second book Mea’ai Samoa: Recipes and Stories from the Heart of Polynesia was published in 2013 at the request of Samoa’s Prime Minister, Tuilaepa Fatialofa Lupesoli’ai Sa’ilele Malielegaoi. The book presents the traditional cuisine of Samoa and looks at the provenance of the ingredients through organic farmers and their land. Mea’ai Samoa: Recipes and Stories from the Heart of Polynesia is one of the finalists for an upcoming award at the Gourmand Book Awards. To view the Tagata Pasifika coverage please click on the video link below. It was a privilege and an honour for me to have had opportunities to talanoa (speak) in person with Robert Oliver regarding his culinary works in the South Pacific. I was also able to attend one of his book talks that he delivered recently at the Cooks the Books bookstore and as one of the guests I was able to sample a few of the recipes from the Mea’ai Samoa: Recipes and Stories from the Heart of Polynesia which was indeed tantilising. I have much respect for Chef Robert Oliver. From what I can see, his love and passion dances to the rhythmic beating of the lali (traditional log slit drums) which echoes the deep and soulful heartbeat of the South Pacific. If South Pacific cuisine can be described as his vaka (ocean going vessel, canoe) then he takes us on a delectable journey through the South Pacific moana (ocean) to explore and navigate the traditional and modern takes on the Pacific region cuisines. Recipes and stories from the South Pacific region are woven together and he gifts us with tapestries of loto tō (humility), tauhi vā (nurturing relationships), mamahi’i me’a (loyalty and passion), fetokoni’aki (reciprocity) and above all ‘ofa (love). Articles and reviews are correct in stating that his books are more than just cookbooks. I view them as food for the mind, body and soul. It is with great pleasure that I share my talanoa with Robert Oliver on this blog. Enjoy! (Please note, MP = Maryanne Pale and RO = Robert Oliver). MP: Growing up in the Fiji and Samoa, what experiences did you have that inspired you to pursue a career in the culinary arts? RO: Going to the Suva markets (in Fiji) as a kid had me excited about the new foods that I was able to discover and taste. Growing up in Fiji had such a strong effect on me. I was surrounded by fresh produce and seafood all the time. And the food markets were one of the places that I loved to visit. That is where my interest in food began. I never went to cooking school because at the time it wasn’t perceived as a career of value. Instead, I studied at tertiary level in a completely different field to that of the culinary arts. However, I found what I was most passionate about and that was cooking. I have never looked back. My Dad reminded me of something that he calls an “intervention”. The week that we arrived in Fiji was the beginning of a wharf strike that went on for several weeks. As a result, my Mum had to learn how to cook local immediately! There were some hilarious results – like the taro that ended up as a kind of pastey goo that my dad joked he would use as wallpaper paste, and beef that was tough that your fork actually BOUNCED off it! But she persevered and became a terrific “local” cook and it was great for me as it meant that ALL of our food shopping was at the Suva market. My Dad loves the fact that this simple “intervention” in effect ended up being the learning base for the book that would go on to to take the top prize in the world! MP: I love the “intervention” hehe! Also, the strong effect that the Suva markets had on you in your childhood experiences is reflected in your advocacy of the origins of Pacific foods. I love that your work, in collaboration with other chefs, are shifting the perceptions of what “Pacific Foods” looks like from the stereotypical e.g. lamb flaps, chicken backs or corned beef, to what you consistently highlight which are the super foods of the South Pacific e.g. coconuts, seafood, dynamic greens, complex carbohydrates and fruit. Why do you think there is such an unhealthy undertone to the perception of “Pacific Foods”? RO: Thank you. I think it dates back to the arrival of the early European explorers and missionaries in the South Pacific with the introduction of new ingredients and live stock. I think also colonialism bought with it in effect a suppression of everything that was essentially Pacific i.e. dress, dance, healing methods, food and much much more. A couple of centuries later and canned meats and other highly processed foods are among the many food products that are being imported into the South Pacific. Such imported products have led to the misconception that corned beef, for example, is a South Pacific product or classified as “Pacific food”. It is not. Corned beef or other canned products are not produced in the South Pacific. The undervaluing of locally grown food has become a result of such imports. MP: Absolutely, I like how you identified such highly processed foods and other imported products as “fat bombs” in your first book. I am glad that you continue to highlight that. RO: Oh yes, another example would be say 30 years ago we would go to the Pacific nations for a holiday and request fish and chips and as a result fish and chips are available everywhere. Today, we are going to the farmers market and now we are regarded as provenance conscious but for the South Pacific region, this has been their way of life for centuries. The entire Pacific region is a farmers market and it’s amazing. Having grown up in Fiji, I have heard on several occasions people say that ‘everything is better overseas’ and even I, as a person raised there, thought that ‘overseas is better’ too. It’s sadly part of the Pacific mindset. So a shift in thinking among people in the South Pacific region is still needed today. Decolonising people’s thinking around locally grown foods will help raise food esteem within and around the South Pacific region. Essentially Pacific Foods are sourced from their plantations and the abundance of the sea/ocean, they are healthy and nutritious. It should be embraced and remembered as exactly that. MP: Why do you think Pacific cuisines are rarely included on menus served in the likes of South Pacific hotels or resorts? RO: Well, I think for so long Chefs across the South Pacific, as well as internationally, have been paralysed by the perception that their local South Pacific foods were not “western” enough to be served on the menus of hotels, resorts and therefore had no place within the tourism sector. My good friend Cath Koa Dunsford calls it ‘food colonialism’ meaning that the cuisines served on the South Pacific menus were predominantly western food. Thankfully, this is changing. I see it especially in Fiji where chefs like Shailesh Naidu are highlighting the awesome local cuisine. It’s happening in pieces through smart chefs like Dora Rossi in Samoa and there are more. MP: It has become a movement and a global one at that which is fantastic. How does your first book address the significance in shifting peoples’ perceptions of their organically grown foods? RO: The publication of Me’a Kai: The Food and Flavours of the South Pacific reclaims the agricultural benefits of the South Pacific region. It values what the South Pacific chefs have to offer and it celebrates the South Pacific people by embracing their cultural and national pride. I hope that my work will encourage people to understand the notion that cuisine can be used as a development mechanism so that we are not only changing peoples’ perceptions about foods but we are also changing peoples’ lives by advocating the growing and eating of local produce and seafood which are bountiful in the South Pacific. MP: Ultimately, the outcome of advocating the growing and eating of organically grown foods would be that eating healthy becomes the lifestyle of everyday people. That is massive. In winning the “Best Cookbook in the World 2010” at the Gourmand world Cookbook Awards in Paris, you proudly stated that “Pacific Island cuisine took its rightful place next to the great cuisines of the world”. Please take us back and describe the moments leading up to the publication of Me’a Kai: The food and Flavours of the South Pacific as well as your experiences thereafter. 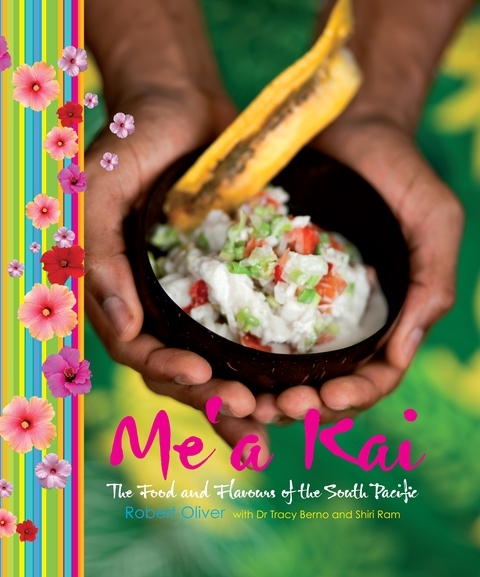 RO: Well, Me’a Kai: The Food and Flavours of the South Pacific profiles the traditional foods and food culture of Fiji, Tahiti, Samoa, Tonga, Vanuatu and the Cook Islands, and it includes dishes from the “modern” Pacific. To me, it’s more than just a cookbook, it is highly peopled. It was designed to be an entry point for a “Farm to Table” process in the South Pacific. Working towards the publication of Me’a Kai: The Food and Flavours of the South Pacific was a huge test of faith and determination to see the vision through. Such a huge project has its risks – and there were pretty tough consequences for me personally along the way. I felt the hand of God during the process of developing the book. Winning the awards in 2010, here in New Zealand and in Paris, validated the values that I believed in such as the Pacific way of sharing. It meant that I was able to bring the awards back to the Pacific with immense pride and literally tears of joy. And what was amazing about that experience was that it felt like that we were only at the beginning of it all. So I believe that we are finally giving the Pacific its due. Winning the Gourmand World Cookbook Award presents Pacific cuisine with a global resonance of which I am still extremely proud of even up to this very day. MP: Wow! I am definitely humbled to be having this talanoa with you. From your observations in the South Pacific, you have stated in one of your talks that Pacific people share food with humour and warmth and that it helps to build relationships and communities. Please elaborate on that. RO: Thank you and don’t feel humbled, be loud and proud ha! [Robert and I both burst into laughter lol!]. Over the years, I have realised that food (same with music) are expressions of the heart which accentuate the nuances of the Pacific cultures and communities. Today, organic agriculture allows farmers to earn a living while remaining at home. In Samoa for instance, there is a business network called the Women in Business Development and currently they have over 700 Samoan families, working on 33,000 hectares of land which are fully organically certified. I am working with Women in Business Development on Samoa’s first ‘Farm to Table’ programme by linking small organic farmers with leading hoteliers and restaurateurs in a bid to boost the farming and tourism industry. This programme has gained the support of United Nations Development Programme (UNDP). MP: That is empowering to hear and I can see the links between agriculture and cuisine within the tourism sector come to life in that sense. Last September, a television series entitled Real Pasifik was produced which was based on your culinary works and the food culture of the South Pacific. It was great to watch the series and you received a lot of support from the Pacific communities here in Auckland. Please take us back and describe one of your memorable moments during the filming. RO: That is good to hear and I’m glad that you watched it. Tonga was my favourite country to be filmed in by the way. It is not shown on the Real Pasifik TV series but at the end of filming for each country, chefs would say a few words to guests to reflect on the whole experience. During one of those occasions, one particular chef was in tears when he stated that being a part of the series reminded him of the richness that he is surrounded by. He was referring to the organic land, the nourishment that the ocean provides and the shelter that he has. This experience and the robustness of the Tongan community redefined what “wealth” meant to him. He is right. The South Pacific is surrounded by plenty of land which have been used for centuries for plantations and the seafood. There were vibrant conversations that had emerged during the filming of this Real Pasifik TV series and it brought attention to the locally grown produce. What we found when we filmed it was that knowledge about traditional food and recipes are being lost. So there is a sense of urgency to document traditional recipes as well as the more modern take on Pacific recipes. MP: Wow. I love that point of realisation that he had. That is powerful. You mentioned that Tonga was your favourite country. Can you please tell me why? RO: Oh, yes. A close friend of mine, Papiloa Bloomfield Foliaki, known affectionately as ‘the Mother of Tonga’ was Shiri and I’s hostess during our visit to Tonga. So the filming of the Tongan episode for the Real Pasifik TV series was an amazing experience. She is an inspiration and I just loved having her as our host. She has her own TV show called Healthy Lifestyles and is an advocate for healthy living and eating. MP: That is amazing. Oh yes, I laughed at the purple and bright yellow ties that you described in your book that Shiri and yourself had worn on your visit to meet with HRH The Royal Princess Salote Pilolevu Tuita hehe! RO: Ha! Fabulous! It was an honour for us to meet HRH The Royal Princess Salote Pilolevu Tuita and to feature her on the Tongan episode. That trip to Tonga was memorable. I look forward to visiting Tonga once again. MP: What new projects are you currently working on? RO: There are exciting things on the horizon. The TV series Real Pasifik is going into its’ second season which I am really excited about! Also, plans are underway for the development of a Pacific Island restaurant here in Auckland. MP: That’s great news! Wow, I am looking forward to the second season of Real Pasifik as well as the new restaurant! How exciting! What is your advice for people who aspire to become specialists in the culinary arts? RO: Well, with the culinary arts I believe that you are not just cooking, you are in leadership. Cuisine has been a doorway for me. It has activated health and it has become much more than a simple dish. For me, it has activated a sense of self. I loved Pacific cuisine growing up and in realising that I enjoyed cooking I immersed myself into it. Along the way I added my personal ingredients to different dishes. I had to reflect on many things which helped me make an informed decision that this would be my choice in career. Questions that I explored were “What am I an expert in?”, “Who am I?”, “If I take a leap of faith, what would it look like?”. Upon reflection, I realised that I’ve got all the expertise relevant to being a Chef so I pursued it. My advice for those who aspire to become Chefs is to follow through on the cuisines that you love. Also, I would recommend that you support the community that you love by demonstrating phenomenal leadership and by being organic. I have enjoyed working with other experts and I believe it is also important that you surround yourself with others that share the same drive and passion as you do. It enables you to learn more as well as grow personally and professionally. 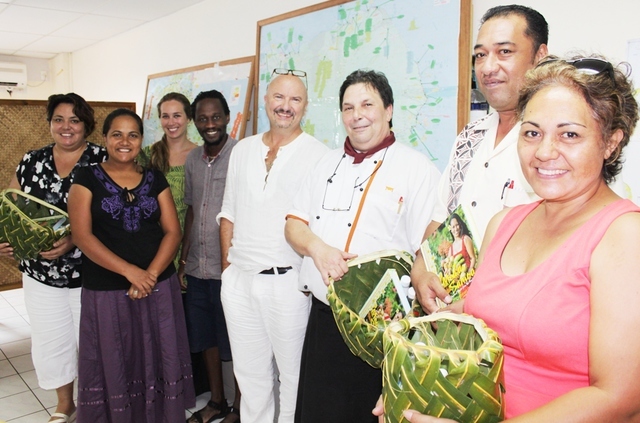 (Photo above: Chef Robert Oliver with staff at the Women in Business Development in Samoa).